The twelfth- and early thirteenth-century textiles from the Chungul Kurgan in Southern Ukraine constitute a remarkable body of material, rare survivals of secular dress from the Byzantine sphere of influence on the eve of the Mongol conquests in the western steppe. They are spectacular fragments, but their degraded condition is testimony to the dangers posed to archaeological textiles by inexpert handling. While the burial of these remarkable pieces of Byzantine silk, encrusted with gold embroidery and pearls, is tied to the history of conquest in the steppe, their afterlife is similarly bound up with the harsh realities of late Soviet and post-Independence Ukraine. At various stages along their journey from discovery to display, the textiles have been subjected to a series of remarkably unfortunate events that have left them damaged, drained of color, and extremely fragile. Their story, however, still provides an insight both into the political world of the Black Sea region in the thirteenth century and in the very recent past. Warren T. Woodfin is Kallinikeion Assistant Professor of art history and Byzantine studies at Queens College, the City University of New York. His research especially concerns textiles and other insignia of power in the arts of Byzantium and its neighbors, as well as the interactions between liturgy and its representations in the arts. 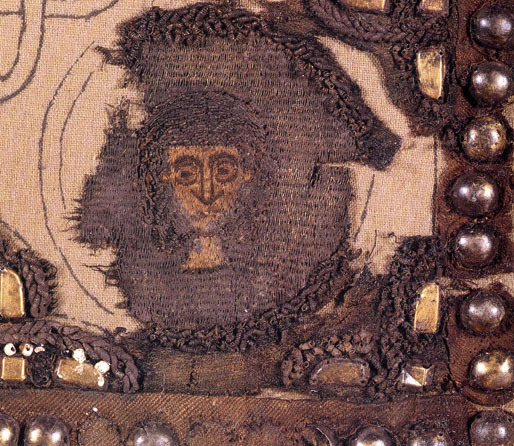 He is the author of The Embodied Icon: Liturgical Vestments and Sacramental Power in Byzantium (Oxford, 2012), and co-editor, with Mateusz Kapustka, of Clothing the Sacred: Medieval Textiles as Form, Fabric, and Metaphor (Gebr. Mann, 2015). In 2015, he was guest curator of the Metropolitan Museum’s installation “Liturgical Textiles of the Post-Byzantine World.” His articles have appeared in Cahiers archéologiques, Dumbarton Oaks Papers, Gesta, Byzantine and Modern Greek Studies, and The Art Bulletin.